Background Info: Clue is a board game that has been around since 1948. The style of the game is murder mystery, deduction, and bluffing. 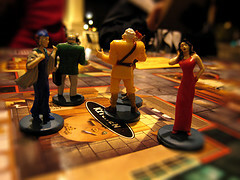 Clue is considered best when playing with 4 or 5 players, but can be played with 3-6. The basic object of the game is to be the first to figure out how committed the murder of Mr. Boddy, with what weapon, and in what room. First place all 6 character game pieces (whether you have 6 people playing or not) on the board at the starting squares marked with each name. The character game piece that each player is physically sitting closest to is the one they will use throughout the game. Next, separate the cards in to people, rooms, and weapons. Select a card out of each pile and put them (without looking at them) in the “Confidential Case File” envelope (essentially you should then have a person, weapon, and room in the envelope). Place the envelope in the center of the game board. Shuffle all of the rest of the cards and hand them out to each player, one at a time in a clockwise fashion, until all cards have been dealt. Do not let anyone see your cards! Lastly, put the weapon game pieces at random into rooms on the board (only one weapon per room). Turns: The player that is using Miss Scarlet (red game piece) goes first. From there, the turns go in a clockwise fashion. Strategy: Use your detective pad to eliminate the possible suspects, rooms, and weapons used in the murder. You should immediately check off the cards that were dealt to you (you know for a fact that those cards aren’t in the Confidential Case File envelope). For each turn, a player will roll the die (unless using a secret passage) and advance their game piece towards the door of the room they are trying to enter. Players can move left, right, up, or down (no diagonal moving), but can’t move into a space that is already occupied by a player. You can use a secret passage as your turn if you are in a room that has that secret passage option on the board. You do not roll the die on this turn if you do use a secret passage. You cannot move through a door if the space is blocked by an opponent’s piece (it is possible to be stuck in a room if all doors are blocked, in which case you would have to pass on your turn until the room is unblocked). You can’t exit a room and then come back in on the same turn. As soon as you enter a room you’ll make a suggestion. Making a suggestion helps eliminate the possibilities of which cards are in the Confidential Case File envelope. A suggestion consists of listing out loud: a person, a weapon, and the room that you entered. When you suggest those items, they must be present in that room with you. Example- If I am Miss Scarlet and I enter the kitchen, I can make the suggestion that Colonel Mustard did it with the rope in the kitchen. As I do this, I will grab the yellow Colonel Mustard game piece and the rope game piece and place them in the kitchen with my red Miss Scarlet piece. There are 3 things to remember about making suggestions: You need to be in the room that you are suggesting (you can’t be in the kitchen and make a suggestion about the lounge); consider all character pieces as suspects (including your own and the ones that aren’t being used by players); there is no limit for the amount of character game pieces or weapon game pieces that can be in each room. As soon as you make a suggestion, the player to your left will look through their cards and see if any of them match (disprove) your suggestion. If they have any cards that were named in your suggestion, they have to show you (and only you) one of them. After it is showed, your turn is over. If the player to your left does not have a card that is named in your suggestion, they will say so and the next player to the left will have to disprove the suggestion. If it makes it all the way around the board without anyone being able to disprove your suggestion, you can make an accusation to win the game. Once it is your turn again, you must enter a new room or leave then come back to the same room (you can’t do this in one turn) before you can make a new suggestion. Make an accusation on your turn when you think you know which 3 cards are in the Confidential Case File envelope. This is done out loud so everyone can hear. Once you make an accusation, that same person will carefully check the envelope to see if they are right. If they are, the game is over and they win. If they are wrong, they carefully put the cards back in (without showing anyone) and forfeit the game. They still have to disprove other players’ suggestions by showing players their cards when asked, but won’t be playing other than that. You can make an accusation on the same turn that you made a suggestion.